A healthy homemade blueberry muffin recipe your family will love. Moist muffins bursting with blueberry flavor! In a large bowl, mix together the wet ingredients – honey, greek yogurt, coconut oil, vanilla extract, and eggs. Whisk together until combined. To a medium bowl add, white whole wheat flour, cinnamon, salt, and baking powder. Slowly fold the dry ingredients into the wet ingredients. 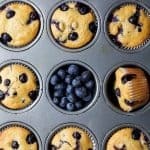 Sprinkle the top of each muffin with remaining blueberries.